We are here to connect you to the world! 4M Connect was founded with the philosophy of giving the customer what they need on time and on budget. Working closely with architects, general contractors, IT managers and other key personnel from small to large companies with assisting them making the correct decisions in all aspects of their project. We only use quality products installed by our professional technicians so you never have to worry about your infrastructure for years to come. We are dedicated to providing quality and professional workmanship. 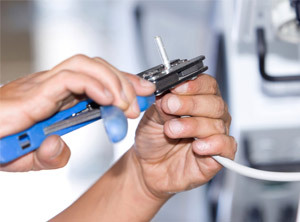 We install and support all Low voltage wiring, Networks, Phone Systems, Security, Video, Audio and much more by our Licensed & Certified technicians. All installed products are warranted by 4M Connect and manufactures warrantees. Why should you use 4M Connect? In this ever changing world, it’s hard to keep up on the latest technologies. Let 4M Connect help you choose the correct cabling infrastructure and equipment requirements that’s right for you and your company. We are dedicated to providing quality and professional workmanship for voice, data, audio, video, fiber optics, security and many other low voltage installations. All our work is warranted under our personal and manufacturers warranties. Let 4M Connect get you connected today. Contact us for a FREE estimate. Available 24/7.